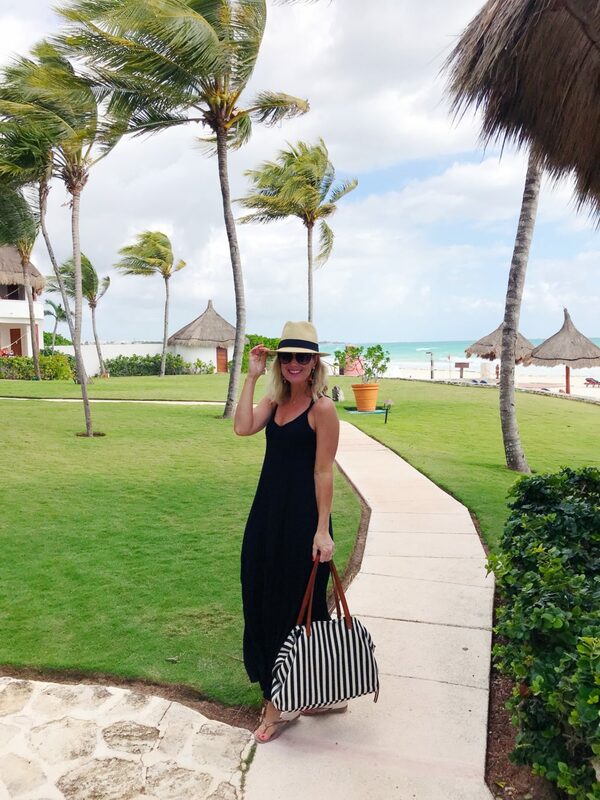 Pack It | What I Packed & Wore in Mexico | hi Sugarplum! Traveling and experiencing the world is a passion of ours, and I love sharing new destinations and travel tips with you. I know vacation time and dollars don’t come easy, so I’m thrilled when I hear my Trip Reports help you make the most of your trips! One of my most-asked travel questions though, is in regards to packing! And I totally get it! 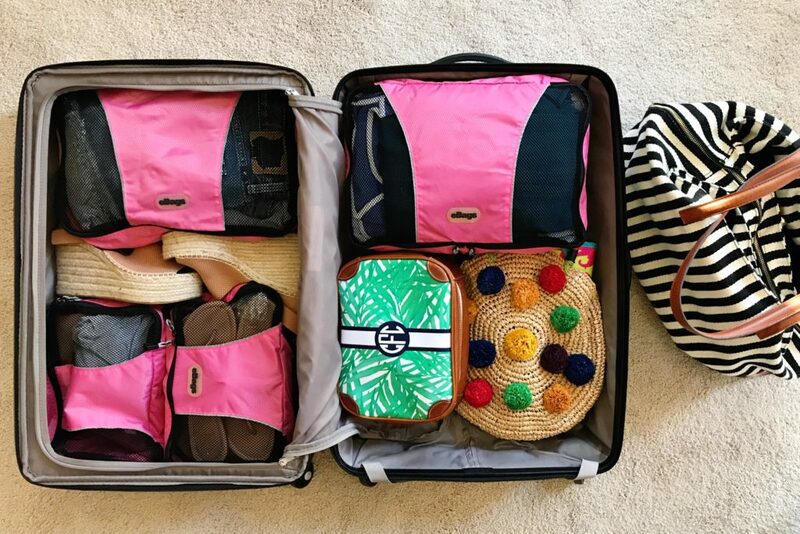 Planning a trip and clearing your life’s schedule to get away is stressful enough, and somehow what and how to pack always seems to happen at the last minute. Or maybe that’s just me! But over the years I’ve learned what I really need to take with me, found pieces that always pack and wear well, and learned some tricks for making it all fit without crossing your fingers it passes weight restrictions! Okay, sometimes I’m still anxiously watching that scale! 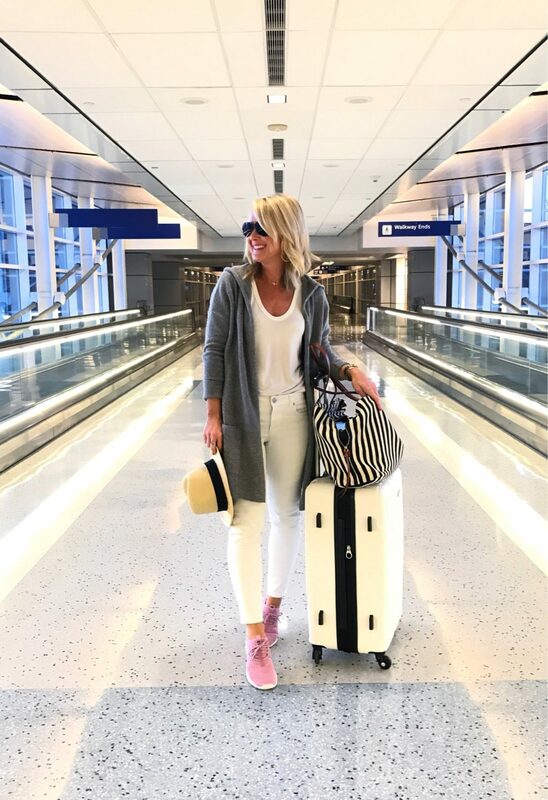 So this year, in addition to sharing our trip recaps (including where we stayed and ate, and best travel tips for what to do), I’m also following up with a dedicated What I Packed & Wore post! 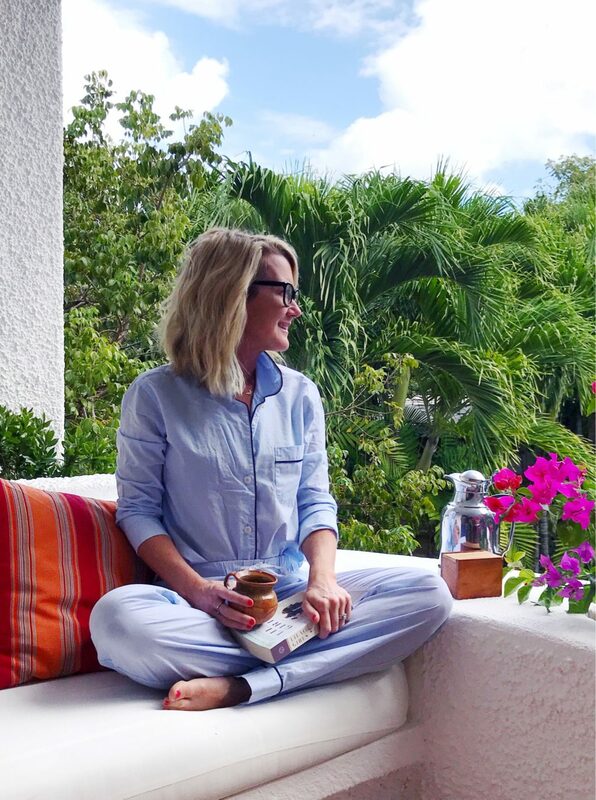 Hopefully these will become good resources for your own trips…starting with our recent trip to Maroma, Mexico. It was a quick four-night trip to a relatively casual locale, but a girl still wants to look cute…especially when it’s a romantic getaway! #amiright?! 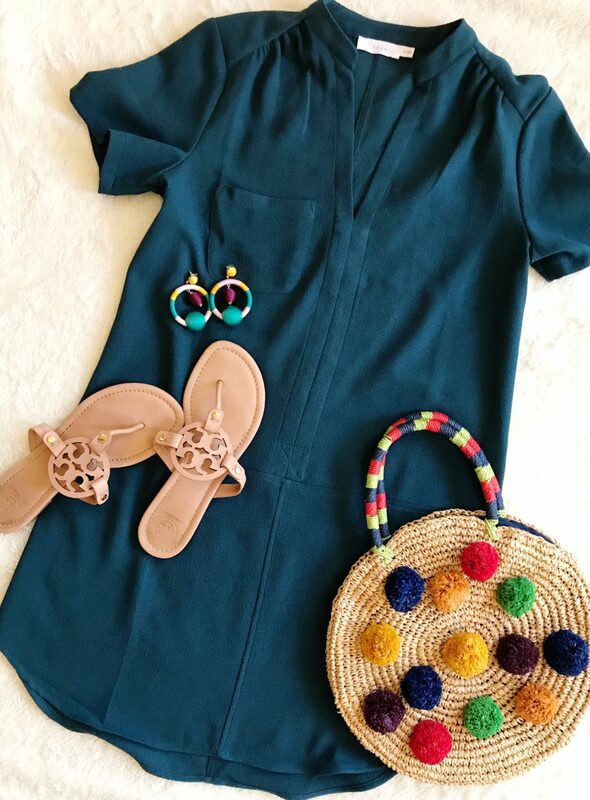 And even though we had room in the suitcase, I still packed smart and chose items that could play double duty and be worn for different occasions that might arise. 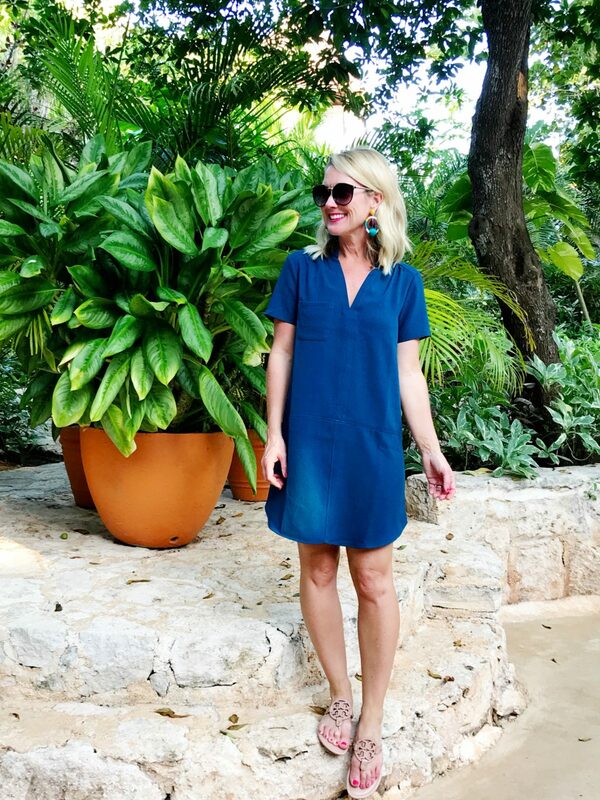 This embroidered dress is lightweight and breezy, ideal for warm days, and the colorful pattern was perfect for Mexico. 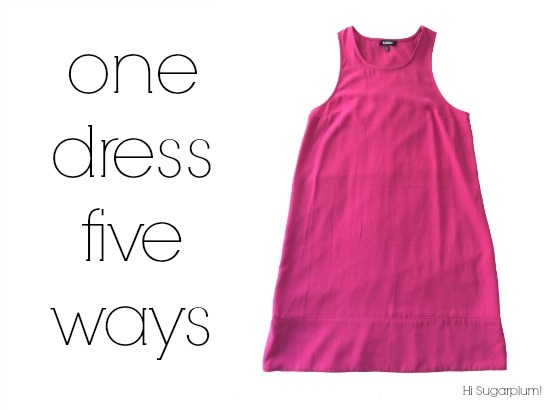 I wore it with wedges to dinner, with sandals for breakfast, and even over my swimsuit by the pool and beach. Sugarplum Travel Tip: When planning what to pack, I create entire outfits (shoes, bag and accessories), and lay them out (using this foldable garment rack) so I can see them all in one place. This allows me to double-check I’m not bringing too-similar pieces, along with my options to easily mix-and-match. 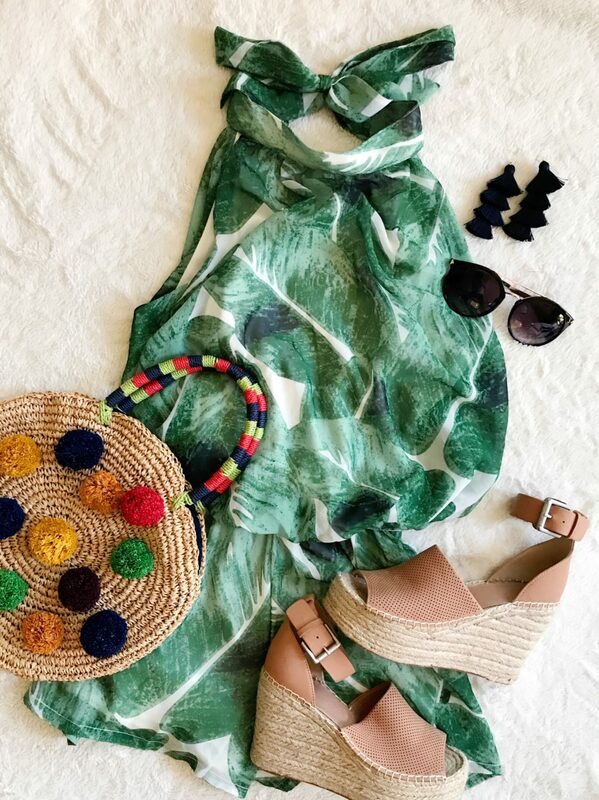 This palm-print romper is darling with both wedges and flat sandals, and even though I only wore it once, it packs so small it was worth bringing along. 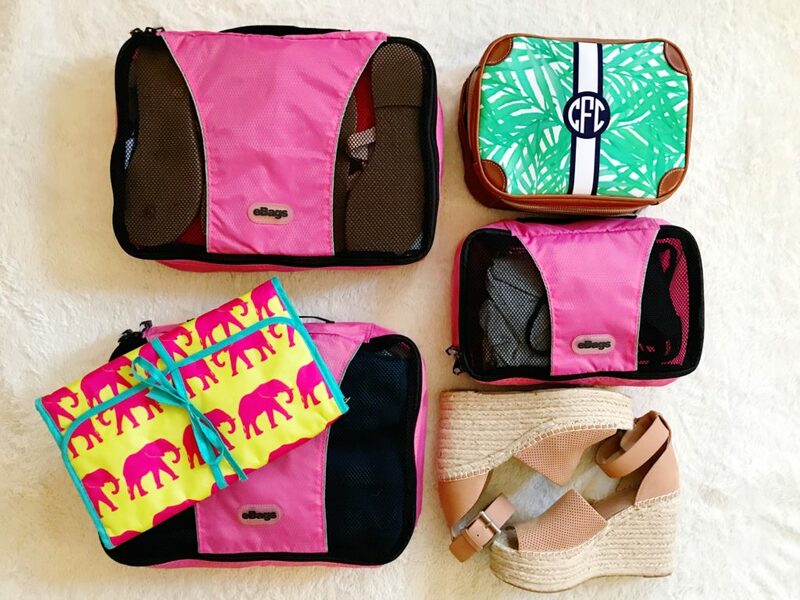 It’s easier to pack more for warm-weather trips, obviously! Cold-weather trips is when you have to be much more selective on what makes the cut! 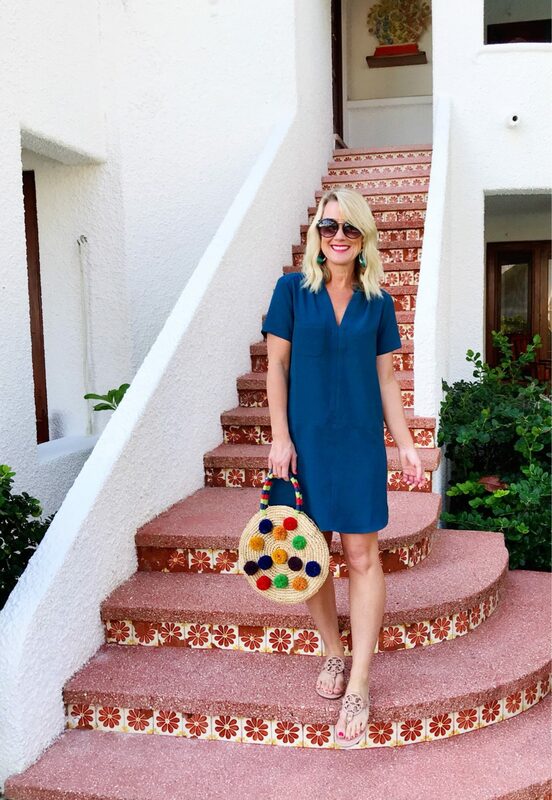 This crepe shirtdress (my favorite under $50 find!) comes with me on virtually every trip…it packs like a dream and works for so many occasions. I wore it with flat sandals to breakfast, and jazzed up with accessories for dinner. Sugarplum Travel Tip: Statement jewelry is the easiest way to transform an outfit, and takes up very little space in your bag. This jersey knit maxi dress is incredibly versatile, and so soft and comfortable! I wore it with cute sandals and jewels, and over swimsuits with flip flops. The black makes it seem dressier than it is, too. 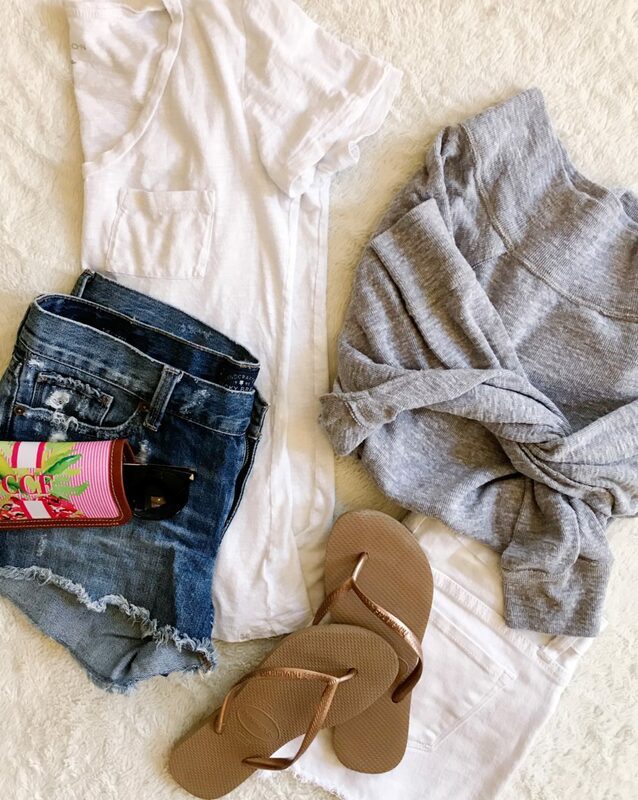 Add a cardigan and it makes a great travel outfit! Fit Tip: Comes in petite, so no alterations needed for me! I wore a petite small. Once I decided on a few dedicated ‘cute’ outfits, it’s time for casual wear. I brought a short-sleeve tee and a sweatshirt, along with cut-off shorts in neutral colors. The shorts doubled as cover-ups when paired with a one-piece swimsuit, too. 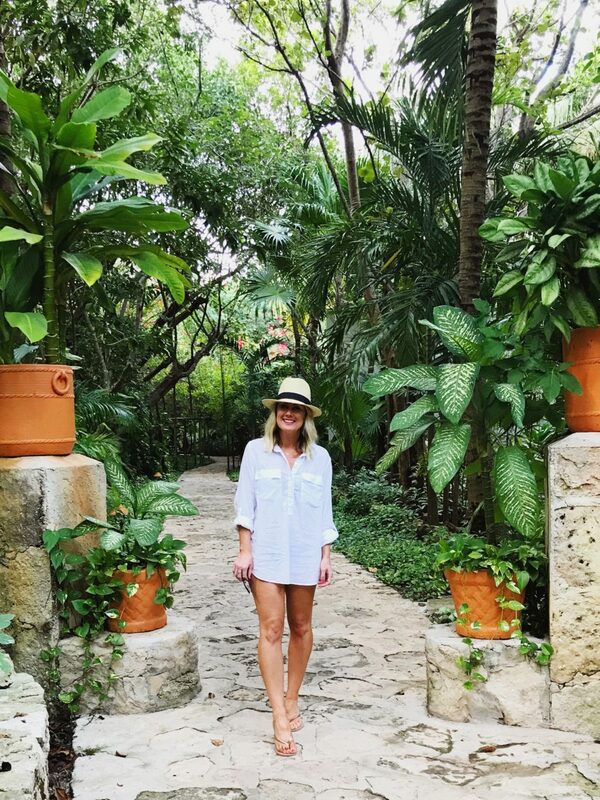 Sugarplum Travel Tip: I always pack a short-sleeve white tee…it always works with jeans, skirts, shorts, and easily dresses up if you’re in a wardrobe pinch. 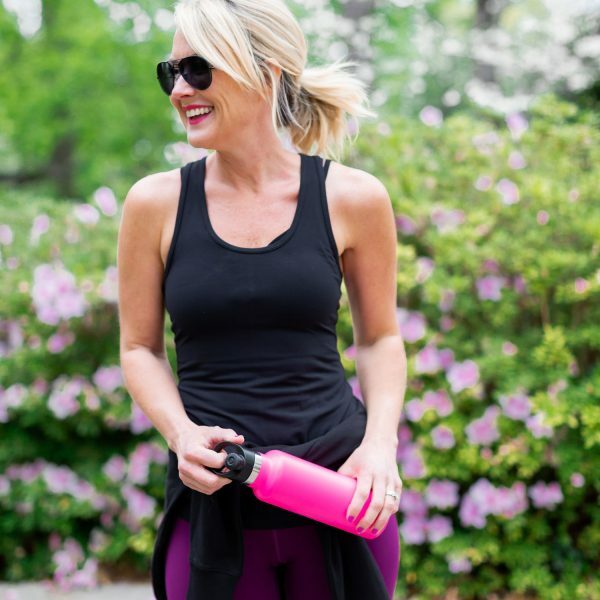 Throw it on over a swim suit, wear it as pajamas, layer it with another shirt if it’s unexpectedly chilly, or even if you decide to go for a run. I brought a single pair of pajamas, but even wore the top with shorts one morning to breakfast (with gold hoop earrings and a popped collar #obviously). Swimsuits take up practically no space in your luggage, but I still chose options that paired well with the clothes I packed. The bikini top doubled as a bra with the maxi dress, and the one-piece made a chic top when worn with the shorts. 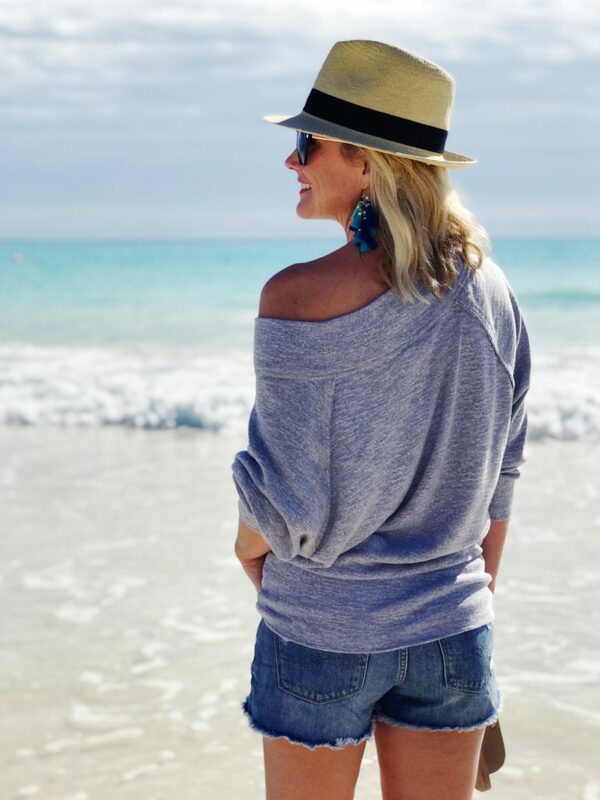 Sugarplum Style Tip: Hats and sunglasses are my secret weapon for looking chic on beach vacation! Add some lipstick, and no one knows you just rolled in from the beach, or out of bed! This hat holds up well to wind and water, and these sunnies are a steal at $14! 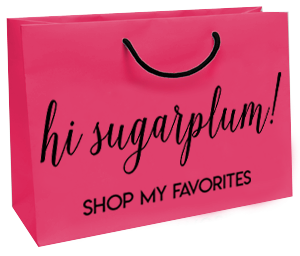 Sugarplum Style Tip: I buy linen tunics or popover tops several sizes up, and wear them as cover-ups. They’re so much cheaper, and easily pair with shorts or a skirt when knotted at the waist. All jewelry and accessories went in a single flat pouch, and toiletries in another bag. I eliminated hair tools and most make-up, since it was a beach trip (thank goodness for this stuff!). Along with my striped tote, which served as my carry-on bag and beach/pool tote, this is everything I brought! The brilliance of the eBags (aside from keeping your clothes neat and organized, and extending the space in your bag! ), they pack like Tetris cubes in your suitcase, so everything is tidy when you arrive! Mr. SP and I actually shared this single suitcase (a hardcase we found at HomeGoods last year)! If we’d wanted to carry-on, we would have divided everything between two smaller suitcases. My credit card membership allows for free checked bags, so unless the trip requires a lot of moving around (like multiple cities by train), I prefer the ease of checked bags. And of course we can’t forget the travel outfit home! 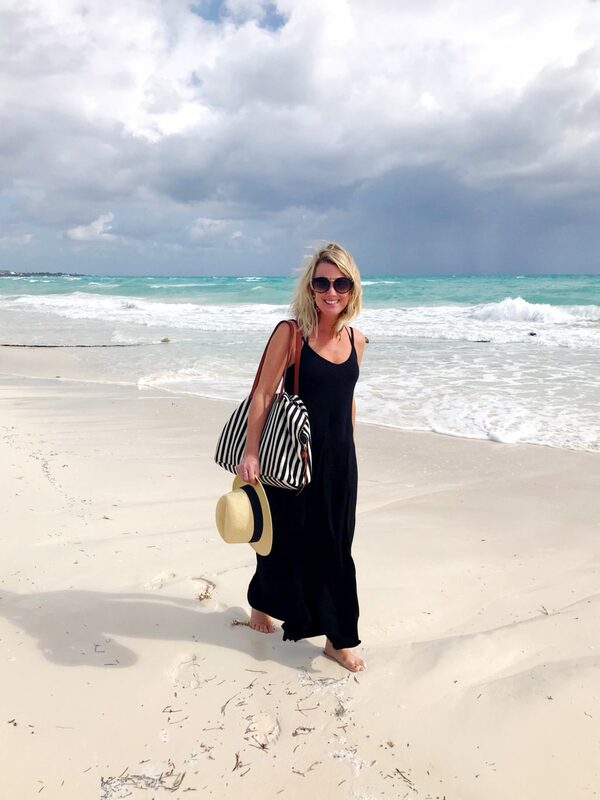 I actually wore this to and from Mexico…the cardigan was warm and soft for the plane (and the freezing cold at home), and easily stashed in my tote when we arrived in the warm climate. 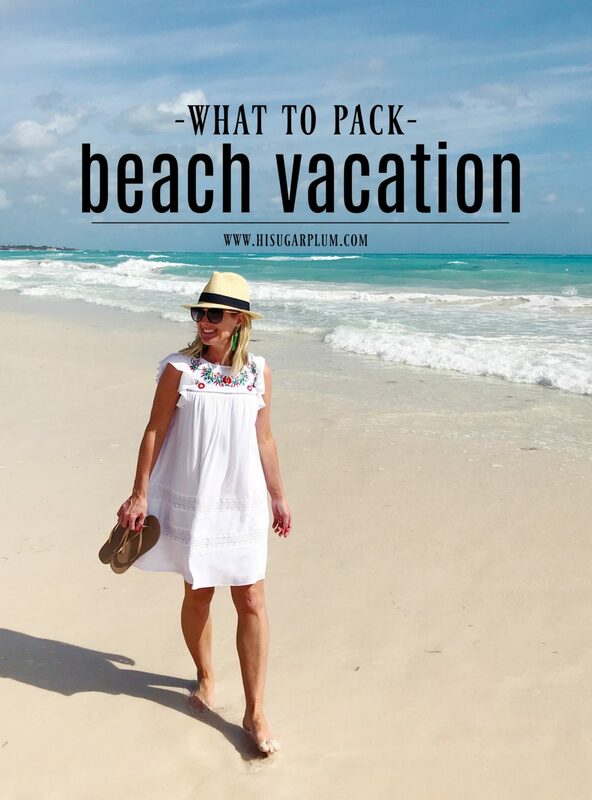 So tell me, is it helpful to see the outfits and packing tips in a dedicated post like this? Is there anything else you’d like to see included in these? Are you headed somewhere warm soon? Happy adventuring, lovebugs! You can see similar posts in my Packing Tips category under the Travel tab. And the full Trip Report on Maroma, Mexico here. YES…this post was super helpful. I leave for Maroma on Friday with college girl friends. We e been planning for months and can’t wait to get away. Weather doesn’t look good for us (AT ALL), but, we’ll still have a ball. I only wish I had time to order that romper! Fingers crossed it’s just a quick afternoon shower, and then back to beautiful!! Have a great trip! Love your blog and all kinds of posts! Lots of women say they use a coverup as a dress but mine always smell like sunscreen and sometimes the sunscreen stains them, especially the white ones. Does that not happen to you? Sometimes, for sure. But for a few days on vacation, I’m okay with that. I also let my sunscreen fully dry before putting on a coverup or dress…that certainly helps! Thanks Cassie! This is a very helpful post! 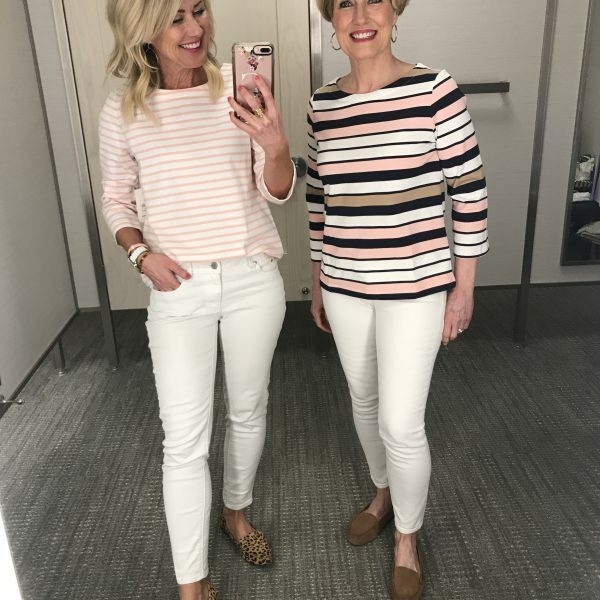 Such cute outfits and wonderful packing tips! I’m so happy you liked it, Kathy!! I was most curious about packing your hat but I’m assuming from your picture that you carry it on!!?? Yes, 98% of the time, I carry my hats! And if I’m taking more than one, I stack them as a single and carry that! 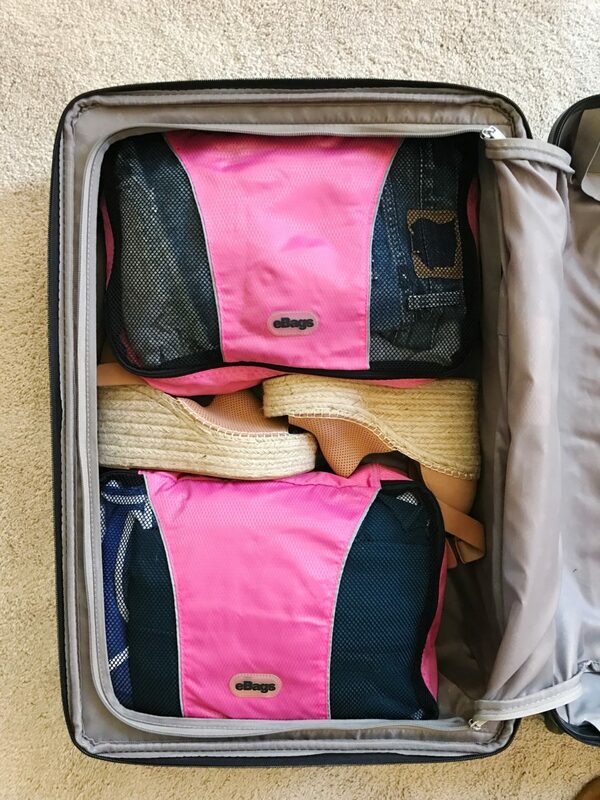 If you prefer to pack it in your suitcase, stuff the hat with soft clothes like undies or tees, and set it brim side down in the bottom of your suitcase…then fill in the area around it. Once it’s a single, even layer, you can pack another layer on top! It takes up quite a bit of room, hence why I don’t do that often. Holla, Colorado!! I always have some sort of dark/bright pink…I think that one was Bachelorette Bash by Essie or Cajun Shrimp by OPI. And I love the Nike Juvenike sneakers, they are mesh and so flexible! Gorgeous photos. Luv the e-bag idea. You must open your luggage and go “Ahhhhh”. For 3 weeks in Australia, I packed one bag of black, white, navy, tan. Everything went together. Boring? Probably! The cardigan is brilliant, like taking a cozy blanket on board. Looks good! Genius idea!!! Especially for such a long trip! Hey Cassie! Is your suitcase the Away Bigger Carry On? No, it’s a Samsonite we found at HomeGoods on clearance!! Hi there! I clicked on several different links, but they all brought me to the same romper. Is it just me? Or did the links get mixed up by chance? Hmmm, they seem to be working for me? Maybe try refreshing the page? Or clearing your cache? I’m sorry, I hate technical difficulties!! Love the tips – thank you! I use the packing cubes too and they are a life saver! My question is have you ever shown what you pack for your toiletries? I can’t seem to pair down when it comes to shampoo/styling products/lotion/makeup! Any tips for that? I don’t pare too much either, I just have smaller versions of everything! I can work on a post about that! I really like posts like these! I’m always trying to figure out how I can pack less for different vacations. I’d like to know what you pack for toiletries like face wash, shampoos, shaving cream, face serums etc. I always wonder if ppl actually pack all that stuff because I do. You got it! And I’m so happy you enjoyed the post! That’s funny…I just shove a bunch of stuff in that toiletry bag! But I can certainly share the necessities! I have started keeping a stocked toiletry bag ready to go, makes it so much easier!! 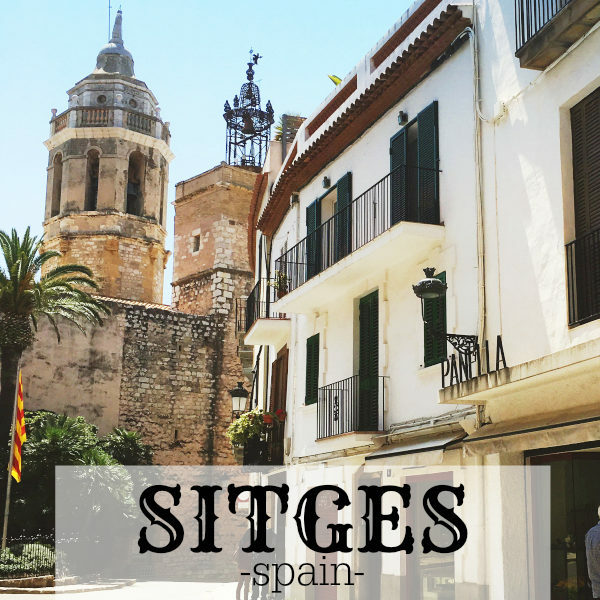 I bought the packing cubes, thanks to you, for my jet setter mom, and she loves them! I have the same Tory sandals. Your footbeds are much cleaner than mine! But, I’ve had mine for 2 years. Any cleaning tips you care to share? I’m thrilled the bags worked out for your mom! It’s crazy what a difference they make. As for my sandals, I actually clean the footbed with a makeup remover every so often! Works like a champ! Oh thank you! Can you please tell me exactly which one you use? I’m intrigued and want to know so I don’t ruin my sandals! Thanks Cassie! Just whatever is in my drawer!! Usually it’s the Burts Bee or Aveeno wipes! My brother and sister in law went to Hawaii on vacation, and 2 days later their baby was born 13 weeks early and flown to a different island. Total nightmare. They’re all together now, but he’s going to be in the NICU for a few months. So they live in Hawaii now. What this has to do with packing is I’m going to visit them and see my tiny 2 lb 10 oz nephew, and there will be a temperature difference of about 60 degrees. I’ll definitely be following your layering advice for the flight! Unfortunately other than that I’ll be thinking more about what to wear in the NICU than on the beach, but I cannot wait to see this tough little fighter. Thanks for always being a ray of sunshine in my day! Oh Lindsay, much love and prayers for continued strength and growing for that sweet baby!! Safe travels and enjoy your time with your family, I know they’ll be thrilled to see you! Oh yeah it’s helpful to have a full post on what you packed and how. I sometimes refer to your posts when cruise packing. We just booked a Caribbean that leaves in less than two weeks so I need to go through my clothes. I do like you and lay out all that I think I want to take and coordinate everything from there to cut down. I’m so thrilled the posts come in handy!! Have a great trip! Thanks Cassie, love your blog! Unless I am in the sun directly, I am always cold. Any advice on how to pack jackets and still keep it simple? I love jean jackets and/or military jackets for light, easy layers that look cute over most outfits. I’d just add it to the eBag, or wear it on the plane!! You are the most organized packer! I love all the suits you brought- so flattering! Cassie, what kind of a bra do you wear with the off the shoulder top? Thanks! YOU IN THAT RED SUIT! VA VA VOOM!!!!! Thank you so much, I’m thrilled my tips are helpful! As for working out, I do the Orange Theory Fitness classes! I loved this post! I leave for Saint Lucia on Saturday, I wish I would have read this sooner so I could have ordered some of your clothes and shoes! I also love the packing cubes. You definitely helped me out! Yes, it is very helpful, please continue to do packing posts when you take trips! Your explanations of why you pack certain things, how things work together and your tips are very helpful. As others have said, I love seeing the flat lays and you wearing the outfits as well. I also agree with others about toiletries, hair care and makeup, that is always the hardest for me to pare down and they end up taking up half of my suitcase. It doesn’t help that I’m a product junkie! What size did you get in the Rebecca Minkoff embroidered dress? XS or S?